The diminutive old woman does not go out in Marseille much any more. She hunches over a cane and is spoilt, mollycoddled by her daughter and grandchildren. Ask her about her childhood, and she becomes perfectly alert. 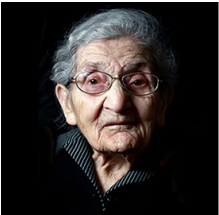 Ovsanna Kaloustian is 106 years old, and one of the last survivors of the Armenian genocide of 1915. As a memory bearer, she is perfectly aware of the role she has to play almost a century later. "God let me live this long so that I could tell the story," she says. Ovsanna has kept a whole host of images and details that she describes energetically, of the terror, the massacres and the deportation of her people from the Ottoman empire. She was born in 1907 in Adabazar, a city about 100km east of Constantinople (modern-day Istanbul). She grew up in a beautiful house opposite the neighborhoods church, with three floors and a garden. The city was an important centre of trade and craft for the Armenian population, which numbered some 12,500 people in 1914, almost half of the inhabitants. "Even the Greeks and Turks spoke Armenian," says Ovsanna. She herself only picked up Turkish during deportation. Her father owned a bar that was also a hairdresser's and dentist's. She went there every morning before school to have tea. Ovsanna was eight years old in 1915, when the Young Turks government ordered the deportation of Armenians. "It was Sunday and Ovsanna's mother was coming back from church; the priest had just announced that every neighborhood in the city had to be emptied in three days," says her grandson Frédéric, who has preserved the family story. Groups set off on foot towards the south and east. Ovsanna and her parents, brother, uncles, aunts and cousins arrived in Eskisehir, where they were crammed on to a livestock train carriage; that's how thousands of Armenians were sent to the deserts in Syria. However, the train was stopped along the way in Çay, in the Afyonkarahisar province, and they were ordered to build a makeshift camp. The triage centres further ahead were already congested. It was not until two years later that they were finally dispersed, and ran to hide in the countryside. Ovsanna remembers being worried about the young girls who were kidnapped by the brigands who served as auxiliaries of the Ottoman army. After the armistice in 1918, Ovsanna and her family returned to find their house burned to the ground, and were driven back out by the city's new Turkish occupants. The exodus first took them to Constantinople. In 1924, Ovsanna's uncles, aunts and cousins emigrated to the US. Four years later, she emigrated to Marseille by boat. "We arrived under the snows of December," she remembers. Today, 10% of the population of Marseille is descended from survivors of the Armenian genocide. Ovsanna earned a bit of money by working in textiles and married the sole survivor of a massacred family, Zave Kaloustian. They opened an oriental shop, bought a patch of land and settled down. "She taught us Armenian, but the stories of her history came later," says Frédéric. Ovsanna works in cultural associations and takes part in community protests. She is a tireless voice in fighting the denial of the Armenian genocide. "Denying the genocide is denying the words of my grandmother," says Frédéric.